When Metro has delays and safety issues, people complain about that. When Metro conducts track work to correct those issues, people complain about that. Does the complaining reflect on Metro, or do people just have more outlets than ever to register minor complaints about everyday life? The endless cycle of complaining and complaining the complaints weren't instantly & perfectly resolved misses a few points. 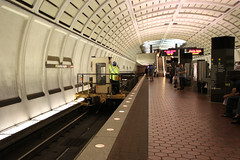 Metro’s doing track work on weekends and at off-peak times both to avoid direct construction delays at rush hour and to avoid the dreaded "moving momentarily" delays in the future. And it's trying to do all of it with no dedicated revenue stream from DC, Maryland & Virginia. While dealing with construction delays – or much more annoyingly, bus bridges past closed stations – is a pain, the alternative is not a magic carpet ride. Chances for delays and frustration abound. Traffic on 66 or 395. Construction on the Beltway. And good luck finding parking in Clarendon or Dupont without paying or driving around for 10 minutes hunting for a spot ... about the same time you’d have been delayed on Metro. And have these people taken the subway in New York City? When weekend construction is going on, the train either doesn't come at all, or you get on and the conductor says, "Due to construction, this train is going express to Nova Scotia," and somehow everyone who lives in NYC knows all this even though there are no signs anywhere. Arlington County has spent literally years asking Westover Market to jump through a series of hoops to maintain its Beer Garden, but the outcome to this point has been good for all sides - Westover Market has expanded its business and hired new staff, Westover residents have a new community gathering place that's jam-packed with customers when the weather's nice, and regulatory concerns have been addressed. Arlington County has developed a web page specifically relating to the beer garden at Westover Market. On the page, it states that establishments with outdoor patios must have ample parking for the number of people being served, but that parking requirement is reduced if the establishment is near a Metro stop. The County allows establishments to get around the parking rule by becoming “seasonal” and closing for three or more months each year. As a progressive, I'm a strong believer in government's ability to protect the common good - public health, public safety, and public resources. Which makes me even more upset when government resources are used for ... what? Providing people an incentive to drive by demanding an arbitrary number of free parking spaces? And I don't get what being seasonal has to do with it at all. The whole episode brilliantly illustrates the stupidity of minimum parking requirements. If stores (or condo developments, etc.) feel they'd get more business by providing parking to customers, they can build a parking lot and give away parking or charge for it. If they don't think they need more parking, people can use the land instead for homes or businesses or parks or whatever else they want. And instead of sending zoning regulators out to count parking spots and telling people to turn down their Jack Johnson cover songs, the government can spend more time educating kids and reducing air pollution and other things that actually make life better. You can show your support for Westover Market through this Change.org petition. Should We Teach Students Climate Reality or Polluter Fantasy? The National Park Service won't even issue its first cherry blossom forecast until March 1, but it's February 23 and the trees in Falls Church are already starting to bloom. Who's ready for an earlier allergy season fueled by global warming? Tree pollen is already considered high. The company points proudly to a sanctuary it established for critically endangered tigers, but World Wildlife’s Jan Vertefeuille says APP’s taking down that rainforest too: "We found out, through satellite imagery, that APP was clearing part of its own tiger sanctuary. They had told the government that they were going to protect this area, and they were actually clear cutting it." Instead of urging the company to clean up its act to make its Virginia operation sustainable in the long term, McDonnell has parroted the company's attacks on anyone who would dare accuse Mercury of wrongdoing. No wonder McDonnell spends so much time trying to regulate women's bodies - otherwise people might realize the only way he can create jobs is by shoveling tax dollars to companies accused of harming wildlife. 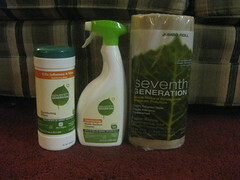 So what are the products you should make sure to avoid, and which stores are supporting WWF's efforts? This controversy drags on because manufacturers are convinced Americans are so pampered that we will only wipe our asses with the finest, most pristine old-growth forest paper our planet has left to offer. Doing the right thing here is really easy: Make sure any paper towels, toilet paper or napkins you buy are made from at least some recycled content, the higher the better. If the store doesn't carry any, ask to speak to the manager and let her know you're a loyal customer and they risk letting you down if they don't improve their selection. I'm also sending an email to Harris Teeter, my grocery store, saying thanks for dropping APP products. Check out the WWF website to see what stores are still carrying APP. UPDATE 2/5/2013: APP has agreed to adopt a new Forest Conservation Policy. Today the Virginia House of Delegates unanimously passed Senator Chap Petersen's “Cost Effective” Public Buildings Act (SB160) which requires state agencies to use environmentally-friendly protocols, such as LEED design and recycled materials, in constructing or renovating state buildings. SB160 will require new state buildings to achieve standards such as the LEED (Leadership in Energy and Environmental Design) 'Green' and 'Silver' ratings. LEED buildings use modern technology to recycle materials, conserve energy and water, and lower operational costs. According to Petersen, LEED design techniques increase construction costs by 1-3%, but deliver immediate savings through cheaper utility costs. Congratulations to Sen. Petersen for sticking with this effort through five frustrating years of inaction in Richmond, and congratulations to Virginia taxpayers, who (assuming Gov. McDonnell signs it) will start saving money soon. Stromberg is exactly right. Climate scientists are largely ignored by the media and almost completely absent from TV news, with exactly zero climate scientists interviewed about the Environmental Protection Agency's proposed limits on climate pollution compared to dozens of climate deniers. But make a prank call that gets the Heartland Institute to hand over documents and you'll be completely ignored (or however more ignored you could be than you already are). Meanwhile, climate deniers like Erick Erickson who call for conservationists to be beaten to "a bloody pulp," compare a Supreme Court justice to a child molester, and hint that maybe President Obama should kinda die get signed by CNN as a full-time talking heads. And people like Stephen Stromberg don't even notice when the Heartland Institute equates climate scientist Michael Mann with a child molester because, well, that's just how science deniers are expected to act. The media doesn't even bother to hide the double standard. You Know I Love Most About Virginia? The Trees Are The Right Height. Want to Make a Primate Video? Use a Mirror. The embattled Heartland Institute has roundly condemned journalists for writing about or posting a climate change strategy memo earlier this week that, while attributed to the organization, Heartland says is a "total fake." But the memo was released late Tuesday night together with other budget and fundraising documents that the right-leaning think tank says appear to have been written by its president and mentions programs that are also detailed in the other documents. The memo in question notes, for example, that one anonymous donor plans to pony up $100,000 to allow Heartland to develop a curriculum for schoolchildren that would "focus on providing curriculum that shows that the topic of climate change is controversial and uncertain." The project is to be spearheaded by consultant David Wojick. The same project is mentioned on page 18 of the budget of the fundraising plan, which Heartland says may be genuine. An Associated Press investigation also finds no reason to doubt the Denialgate documents' authenticity. Heartland's bleating about documents which it apparently willingly handed over to someone posing as a board member stand in stark contrast to its gleeful reaction to hackers stealing the emails of climate scientists, which remains the subject of an active criminal investigation. 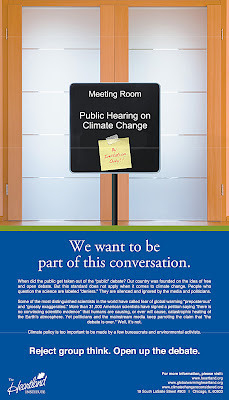 As Zachary Shahan at PlanetSave.com writes, "Three years of nonsense and praise for 'Climategate' combined with the continual misrepresentation of what it actually was, and now the Heartland Institute wants to call in the referees and have us all sit peacefully in a thoughtful moment on how wrong it is to steal information and misrepresent people?" The Green Miles has been tracking the Heartland Institute's shenanigans for years now, but even I couldn't imagine something like the scandal that's unfolding today. Leaked internal documents detail Heartland's plan to use a secret funder's money to replace climate science with polluter propaganda in America's school curriculum. Later in the memo, its author warns that the business and financial magazine Forbes, which publishes a blog by Heartland Institute senior fellow James Taylor, has "begun to allow high-profile climate scientists (such as [Peter] Gleick) to post warmist science essays that counter our own." "This influential audience has usually been reliably anti-climate and it is important to keep opposing voices out," the memo states. So while Heartland was complaining publicly that they were being ignored & silenced, the documents show they were working behind the scenes to make sure climate scientists were ignored & silenced. In the sage words of Anchorman ... why don't you stop talking for a while? Maybe sit the next couple of plays out. UPDATE: Heartland claims the documents were not theirs AND that they were stolen. Wrap your brain around that one. The U.S. Senate may vote Tuesday on whether to green-light the proposed Keystone XL tar sands pipeline even before a safe route has been determined. Why is that a terrible idea? TransCanada wants to build this pipeline so it can stop dumping tar sands oil at a discount in the Midwest. TransCanada's own analysis shows it would raise Midwest gas prices by 15 cents a gallon. How does that impact states outside the Midwest like Virginia? American consumers could pay an extra $500 million for goods from the Midwest thanks to those higher gas prices. A Cornell University study found those higher gas prices are one reason Keystone would kill more jobs than it creates - again, especially in a state like Virginia that would see few (if any) jobs directly created by the distant pipeline. The pipeline would do nothing to lower U.S. gas prices because the oil will be sold on the international market. Think about it - if you wanted to sell the oil in America, why would you build a pipeline literally all the way down through America to the Gulf Coast? The pipeline would benefit from billions in taxpayer subsidies. TransCanada predicted its Keystone I pipeline would spill once a year. It's spilled once a month. Tar sands oil emits far more carbon pollution over its life cycle than regular oil, fueling the global warming that's threatening Virginia. Please take a moment to call Sen. Mark Warner at 202-224-2023 and Sen. Jim Webb at 202-224-4024 and ask them to say no to Keystone XL tar sands pipeline. If you can't call (or if you don't live in Virginia), email your members of Congress. As an added bonus, doing the right thing by killing Keystone XL is also a political winner. Isn't it nice when good policy and good politics come together? The Koch Brothers make several kinds of bathroom tissue and paper towels, using the profits to fund their war on President Obama. Isn't it worth it to spend a few extra cents on Seventh Generation products to know your money is not just staying out of the Kochtopus' tentacles, but proactively working to make the world a better place? The national average temperature in January was 36.3 degrees F, which is 5.5 degrees F above the long-term average and the warmest since 2006, according to the National Oceanic and Atmospheric Administration's National Climatic Data Center. The other warmer Januarys were in 1990 and 1953. The data is based on records dating back to 1895. According to data from the Rutgers Global Snow Lab, the average snow cover in January was 1 million square miles, which was 329,000 square miles below average. This marked the 3rd-smallest January snow cover extent in the 46-year period of record. USA Today's article does not mention global warming in his write-up, despite the fact that 3 of America's 4 warmest Januarys have now come since 1990 and 2011 that the 9th-hottest year on record globally. Read more on the warm January at NOAA.gov. The new book The Conundrum claims that despite gains in energy efficiency, real energy savings will be hard to achieve because people want giant houses in the suburbs necessitating long driving commutes. Except a new survey shows Americans strongly value having sidewalks and being able to walk places. That backs up earlier research showing both a preference for right-sized homes over McMansions and that younger Americans hate driving. 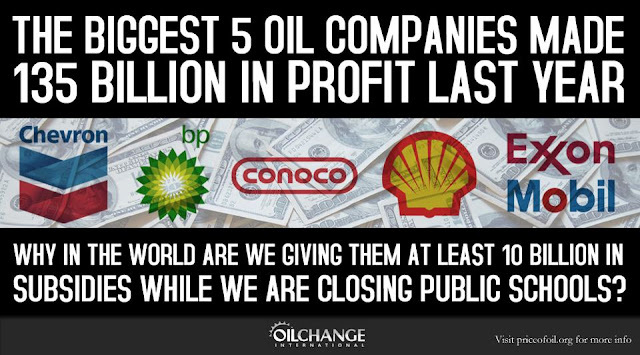 Don't think we should be giving away billions in our tax dollars to oil companies already making massive profits by polluting our air & water? Tell your members of Congress it's time for a change. The latest Congressional scorecard from the League of Conservation Voters flunks every single Virginia Republican, including House members like Scott Rigell, Rob Wittman and Frank Wolf who'll be trying to sell themselves as moderate in November. Committed opponents of clean air & water, public health, and wildlife like Eric Cantor, Randy Forbes, Bob Goodlatte, Morgan Griffith and Robert Hurt all scored in the teens. Meanwhile, Virginia House Democrats Gerry Connolly, Jim Moran and Bobby Scott all scored 100%. What drew the LCV's ire? Every single Republican voted for the House Republican budget resolution to gut the Clean Air Act & Clean Water Act, to protect billions in tax giveaways for oil corporations that banked $137 billion in profits in 2011, and to weaken offshore drilling safety rules even as they pushed to bring oil drilling to the Virginia coast. On the Senate side, both Sen. Mark Warner and Jim Webb scored 100%, though given that both support oil drilling off Virginia's shores and Webb has opposed clean air regulations, neither is perfect on conservation. 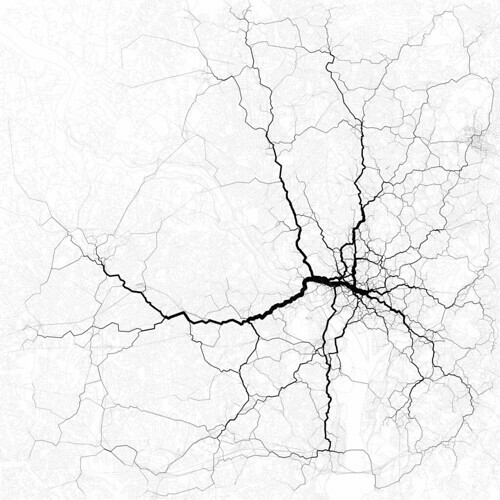 Routing 30,000 randomly-chosen trips through the paths suggested by 10,000 randomly-chosen geotags. These are perhaps the most interesting routes between the endpoints of the trips, even if not necessarily the most likely. Note that the routes go in & out of the city center, not around it. Makes you wonder who Gov. Bob McDonnell is really working for when he pushes terrible, incredibly expensive ideas like the Outer Beltway. Check out more of Eric's work on Flickr. The Green Miles spent the weekend in Massachusetts watching the Patriots lose the Super Bowl. If that wasn't bad enough, global warming denier Rush Limbaugh spent the game picking his nose in the Patriots owner's box. A visit to an aunt & uncle in Fairhaven, MA proved to be an interesting case study in climate messaging. My uncle finds Rush Limbaugh & Bill O'Reilly too moderate for his tastes, preferring Michael Savage, Sean Hannity & Glenn Beck. So I was curious what he thought about plans to build wind turbines in Fairhaven with proposals to build turbines in Buzzards Bay. My uncle said he supports the projects, saying he thought arguments about health effects didn't hold water. He was also excited for the tax revenue the projects would bring. Given that New England just had one of its warmest months of January on record, would arguments about cutting climate pollution sway him? His kids once played pond hockey - had he noticed there was no ice to be found in southeastern Massachusetts this winter? He's told me stories of foot-thick ice covering Buzzards Bay - why could I only remember seeing it frozen over once in my lifetime? "It's all cyclical!" he said. I did not press him for details on when we can expect this half-century-long warming cycle to ease. Later, my girlfriend and I went for a walk around Fairhaven's Fort Phoenix. When we got home, she noticed she had a bug bite on her leg. In Massachusetts. In February. Thanks to you and your hard work, the uranium industry did not have the votes in the General Assembly to introduce a bill to lift the ban. On January 19th, Gov. McDonnell was forced to concede that a report from the National Academy of Sciences identified “important questions related to the health and safety of workers, the public, and the environment.” As a result, the ban will stay in place for 2012. 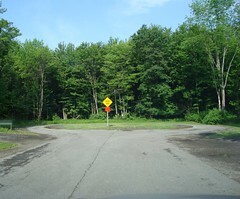 At the same time, however, Gov. McDonnell directed Virginia’s health, mining and environmental agencies to draft “conceptual regulations” for the General Assembly to consider in 2013. Governor McDonnell’s directive to create a draft statute and regulations, behind closed doors, is the first step toward lifting the ban. 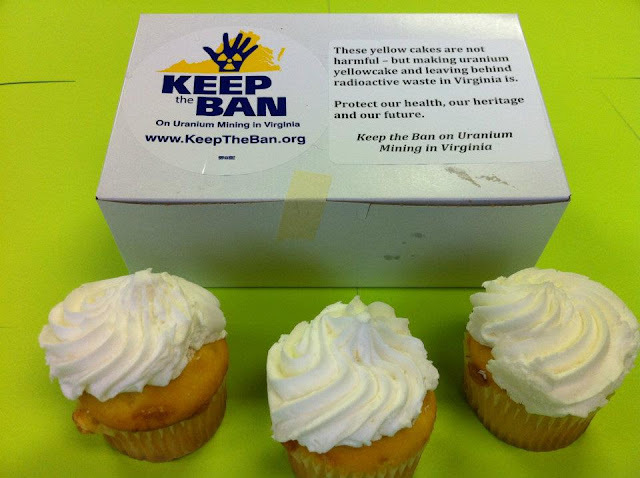 The uranium industry has yet to show the citizens of Virginia that uranium mining can be done safely, and our legislators have not answered the fundamental public policy question: does Virginia want to take on the long-term economic and public health burden of mining uranium and storing millions of tons of toxic waste in our state? 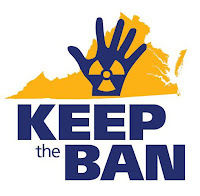 Sign the petition to keep Virginia's 30-year-old uranium mining ban in place and "like" Keep The Ban on Facebook to get the latest news. Dominion Virginia Power is interested in building up to 400 wind turbines in Atlantic waters in what could be a powerful message for a slowly emerging domestic source of clean energy. "If everything aligns and it makes good sense and we have our regulators on board, yes, we would be moving forward on a wind farm," Mary Doswell, Dominion's senior vice president for alternative energy solutions, said Thursday in an interview with The Associated Press. The article doesn't say how much electricity will be produced, but Cape Wind only has 130 wind turbines and will produce up to 420 megawatts, so we could be looking at several coal-fired power plants worth of electricity. That power will come with none of the millions of tons of deadly air pollution the equivalent coal plants would produce each year. 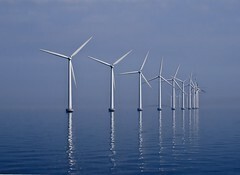 Additionally, Cape Wind is expected to create up to 1,000 construction jobs and support 150 permanent jobs. While Doswell said offshore wind energy costs 28 cents per kilowatt hour, Cape Wind is set to be sold for less than 19 cents per kilowatt hour and I'm not sure why there's such a wide disparity in Dominion's estimate. Down the road, conservationists will need to get behind the plan to tell regulators they're happy to pay a little more on their power bills to keep our air & water clean and preserve Virginia's mountains for future generations to enjoy. For now, email Gov. Bob McDonnell to let him know you want wind turbines - not oil drilling rigs - off Virginia's beaches. Punxsutawney Phil will be pulled from his caged slumber tomorrow to do his faux forecasting duty, but most groundhogs in the wild will sleep through to spring to finish their winter’s hibernation, a seasonal behavior that is key to their long-term survival. However, with this year’s warm winter, which some experts pin on global warming, biologists say groundhogs and their hibernating brethren might rise closer and closer to Groundhog Day each year as Earth's climate changes. 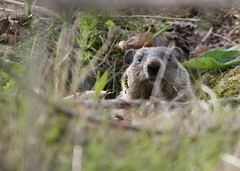 The balmy weather could snap awake groundhogs and other hibernating animals too early this year, well before their breakfasts are ready and threatening their survival. Global warming loads the dice for milder winters. How warm has this winter been? The DC area is having its 4th-warmest winter on record & of the 21 warmest January months in DC history, 4 have come since 1998. That fits right into the global trend - 2011 was the 9th-hottest year on record according to NASA. And since 1976, 2011 was the 35th consecutive year that the yearly global temperature was above average. And it's important to remember how global warming has completely changed the record books - until the late 1990s, 2011 would've been the hottest year on record. Man-made carbon pollution has rewritten our temperature records as thoroughly as steroids rewrote baseball's home run records.